Oracle VM VirtualBox Extension Pack for Windows 10 - A tool for creating virtual machines based on x86, x64 architectures. The program allows you to interact with cloud storages, includes a selector of the created stations, provides video recording of operations inside the machine with the possibility of audio tracking. The functionality of the environment provides full support for USB 2.0 controllers, remote connection to running virtual machines using the Intel PXE boot ROM and gigabit network cards. Allows you to work with most guest operating systems, supports the integration of nix systems and custom assemblies. 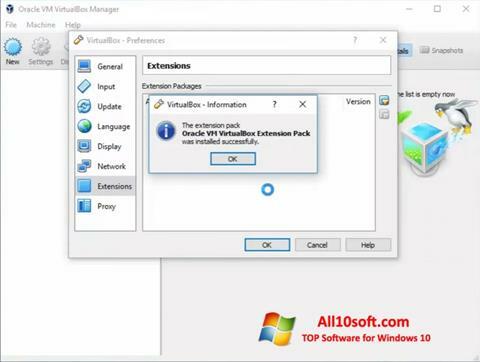 You can free download Oracle VM VirtualBox Extension Pack official latest version for Windows 10 in English.